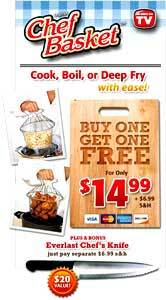 Cook, Boil or Deep Fry with ease! The Chef Basket is the new way to make kitchen work quick and easy. It starts off flat and instantly expands to a flexible basket that lets you cook, boil, or deep fry foods with ease. Even when hot water or oil is rapidly boiling in the pot, the specially designed handles stay cool to the touch. So you can safely lift out the Chef Basket and go right from the pot to the plate. No more pouring boiling water into a wobbly colander. Cook pasta, shellfish, veggies, fried chicken...virtually anything! Buy 1 Get a Second FREE! It’s the best way ever to make hard-boiled eggs because you go right from the pot to the ice water. No More Cracked eggs! Invert the Chef Basket and it turns into the ultimate steamer. But there’s more! Flip down the handles and it’s a free standing colander. You can rinse your food in the Chef Basket, lift the handles back up and go right from the sink to the pot in one easy motion. Best of all, it folds flat for easy storage anywhere. The Chef Basket has solved most of my woes because it couldnt be any easier to use, plus the fact that it folds down flat for easy storage is a major bonus in my cramped kitchen! I stick mine right along side my cookie sheets for easy and convenient access and compact storage.